No matter where you go or how plan to get there while traveling this spring or summer, you are likely to encounter situations where allergies and other irritations can become genuine problem. Of course allergies aren’t really following you around. It only seems that way. But it really can pay to have a simple, smart strategy in place to prevent problems before they occur. The good news is this: Your allergy-free traveling plan can make use of simple yet effective methods to anticipate known and unknown sources of allergies or other illnesses. One of those sources is, of course, the surfaces you come in contact with while on the go. Staying in hotels or even the house of a friend can bring you in contact with allergy sources. Since you can’t control every environment, it helps to have tools that can make your travels safer. One of the most effective ways to reduce allergens and even germs in any travel space is handheld UV sanitizers. These little miracle workers are the best friend in the world for people who suffer from allergies or asthma. A CleanWave UV-C sanitizing wand is portable enough to take with you in most travel bags and can be used to instantly eliminate 99.9% of bacteria and mold, kills bed bugs and dust mites and even wipes out E.coli, MRSA, Influenza A, to name a few. 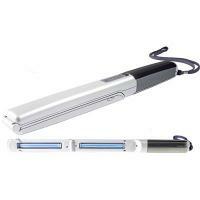 Go even more portable with the Zadro Nano-UV Disinfection Light Scanner. This cell-phone sized UV sanitizer can be tucked in your pocket and used on handrails, airplane seats and arm rests, bathroom door handles, TV remotes and even the pillows where you rest your head. There is probably no better investment in terms of instant prevention of the germs and allergens you least want to eliminate. Both these sanitizers are just $79.99, and the combo can give you peace of mind every inch or minute on the road. Even taxicabs and other public places can be rendered safe, and give you peace of mind. When it comes down to it, you can’t be too careful with some aspects of your personal hygiene when seeking to prevent allergens or germs from invading your breathing and personal space. 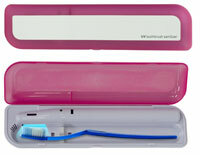 That’s why toothbrush sanitizers are a great way to kill 99% of the germs that linger on your most intimate device. Brush in clean confidence for only $9.99! The other facet of allergy protection is the air you breathe. That means travel air purifiers are an important preventative step to keep your sinuses and lungs safe from allergens. So check this out, the Wein Mini-Mate Wearable Air Purifier cleans the air anywhere you go. Hang it around your neck and eliminate allergens, bacteria and viruses from the air you breathe before they can affect you! This little wonder is maintenance free and scientifically tested, so we aren’t talking about some low-benefit, hi-tech device that does not work. It simply purifies the air you breathe through the proactive use of air ionization while propelling clean, fresh air into your breathing zone. Only 1.5 ounces, it also comes with a breakaway strap for user safety. When you get where you’re going and want to ensure the air you breathe is safe and clean, the Vapor Eaze Clean Air HEPA Air Cleaner will do the trick in spaces up to 180 square feet. You’ll feel peace of mind knowing you’re filtering air from germs, bacteria and viruses. Ultimate One-Wipe® Dust Cloths are go-anywhere dust knocker-outers that can be used to prevent dust from kicking up into the air and setting your allergies off like an alarm. With six wipes per package they are already a bargain at $14.95, but when you add in the fact that they are machine washable and re-usable, you’ll want to buy some for around the house as well as on the road. But let’s face it, there are some situations that are simply out of our control when it comes to controlling the environments we encounter. For those situations, it makes sense to have a direct strategy to deal with allergy sources. Allergy masks are simple to carry and even simpler to use. 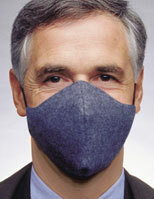 The Multi-purpose allergy dust mask is a practical prevention tool for filtering out allergens. The air pollution mask is designed for outdoor and indoor air filtration and is especially helpful in regions where smog and high allergy counts can trigger reactions or asthma, which are proven to be related to allergies. Trust the 3M HEPA Mask to filter out 99.97% of airborne allergens and other irritants. If you have chemical sensitivities, there are a whole range of products you can carry with you as you travel that are also vital protections at home. These personal products are great for eliminating risks from shampoos, water and other chemical sources. All these products can make your trips safer and more enjoyable this spring and summer. Happy traveling!